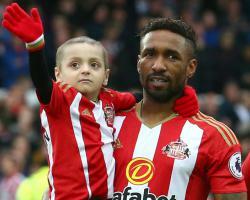 The England striker struck up a close friendship with Bradley during his time at Sunderland. He died on Friday, aged six, leading to tributes from all across the game. "I feel so blessed God brought you into my life and has some amazing moments with you and for that I'm so grateful." Really finding it hard to find words to express what you mean to me." God has you in his arms and I will always carry you in my heart. Sleep tight baby boy and fly high with them angels."